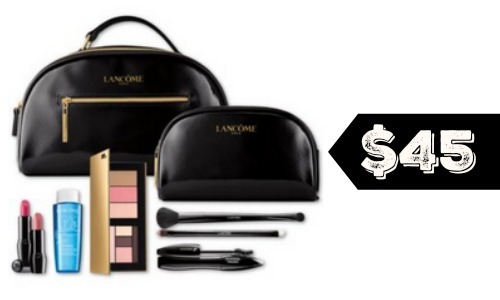 For a limited time, Macy’s is offering the 9-Piece Spring 2017 Beauty Box Collection for $45 with any Lancome Paris purchase. This box includes a makeup case, train case, eye brush, cheek brush, full size mascara, two lipsticks, eye shadow and blush palette plus more! You can also receive a Free 3-piece makeup gift with any $50 Lancome purchase and a Free Mystery Gift with any $50 purchase. Also, get a free skin foundations sample with any makeup purchase so several freebies available.